One of the issues that I have seen at many transmitter sites is inadequate cooling. Time was, when mostly tube transmitters were in use, a simple fan connected to a thermostat was all that was used to cool most transmitter sites. Even then, however, that setup was lacking for several reasons. The amount of cooling provided was limited by the amount of heat in the outside air. On cool winter days, this is not a problem, but on hot, sticky summer days it could be. No removal of humidity from the transmitter room was possible. This often lead to excess oxidation, corrosion of metal parts and so on. No matter how much filtering was used, bugs, dirt and other debris was sucked into the fan, making transmitter room cleaning a chore. With solid state transmitters, air conditioning is required. Solid state transmitter devices are far less rugged than tubes when it comes to heat. In a high heat situation, a tube transmitter will keep running until its control circuits malfunction, or it catches on fire. A solid state transmitter will crash long before either of those things happen. Air conditioners should be adequately sized for the heat load plus a little extra. That information can be found in a previous post: A tale of two air conditioners. As we all know, equipment malfunctions. When an air conditioning system goes bad at a transmitter site, things start to happen fast if there is no backup. That is when a backup cooling fan can save the day. 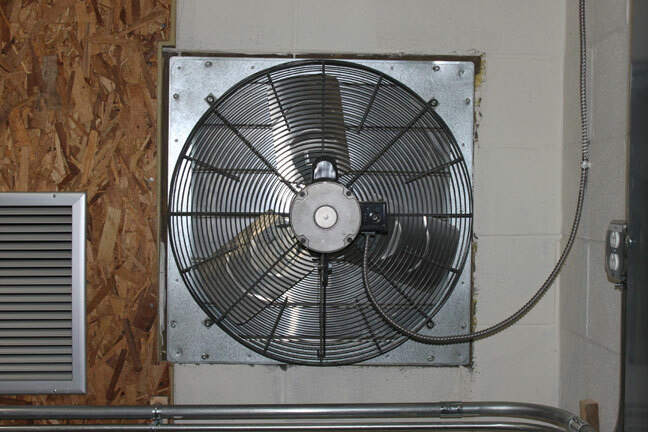 A good rule of thumb for sizing a cooling fan is to exchange the total volume of the transmitter room every two minutes accounting for resistance from louvers and intake openings. This fan is connected to a 120 volt contact on a thermostat attached to the ceiling of the transmitter room. The thermostat is set for 90 degrees, which gives a good bit of headroom for the air conditioners to maintain the room temperature, while turning the fan on before the room gets too hot. It is also important to monitor the room temperature via remote control. Having an alarm contact connected to the fan thermostat is also a good idea. There is no such thing as too much backup. Installing a louvered cooling fan affords a little bit of extra insurance.